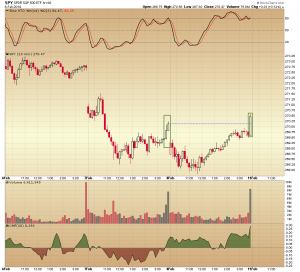 We saw some signs of life on the Apple (AAPL) chart yesterday. The stock price was only up fractionally, but the close was near the high of the day. 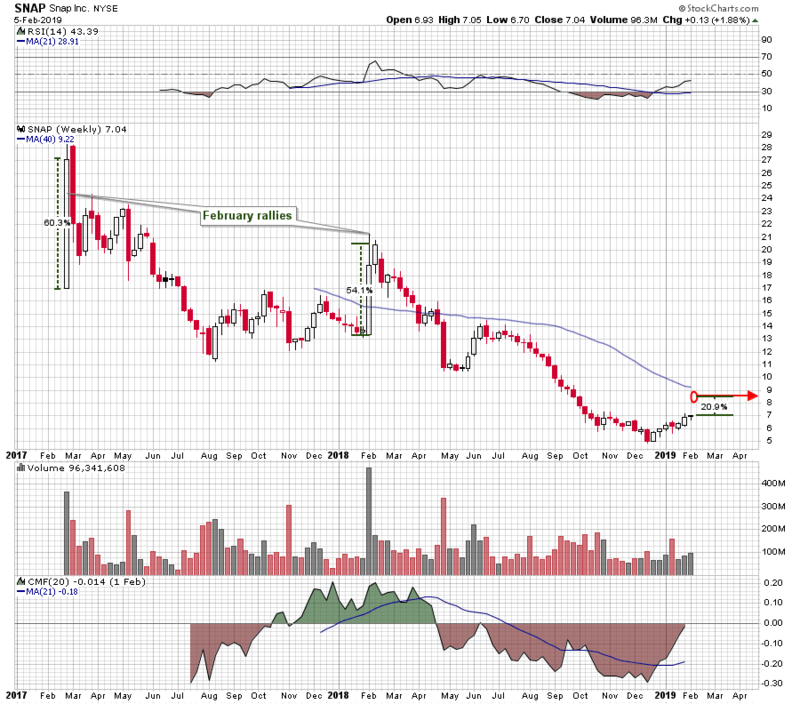 This formed a strong looking bullish marubozu candle on the daily chart. The marubozu candle is one with no or very little upper or lower shadow. It is a bullish sign if the open is at or near the low of the day, and the close is at or near the high of the day. A bearish marubozo is a candle with the open at or near the high of the day and the close at or near the low of the day. After a nice bounce in January, Apple began moving sideways in a very narrow range. 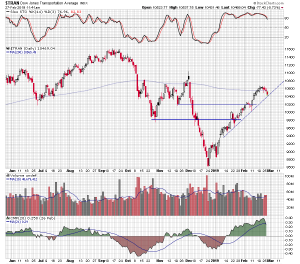 The $170 level has been support and the $175 level has been resistance. 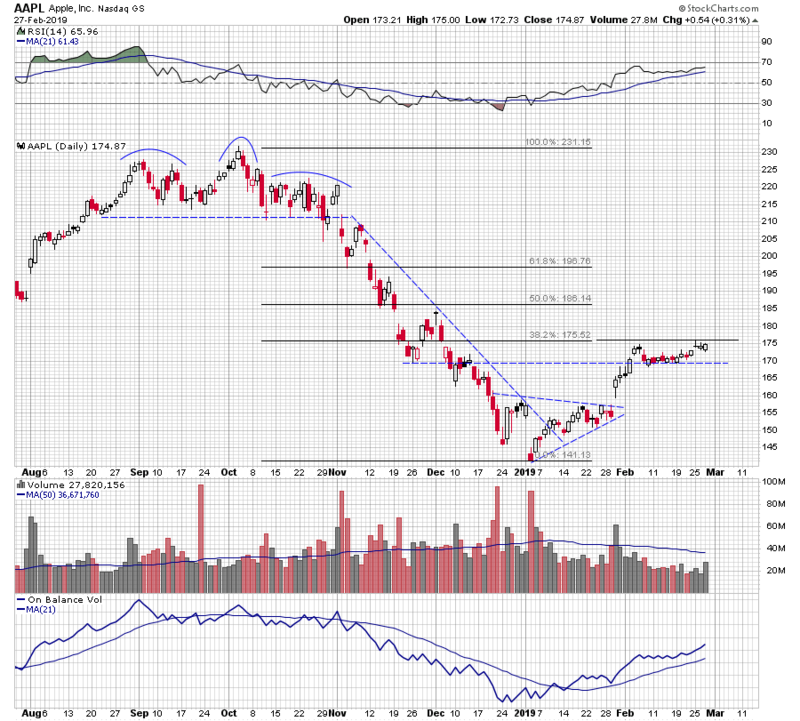 The $175 level is also the 38% Fibonacci retracement level of the October 2018 high and this year’s January low. Notice the 21 period average of the relative strength index. 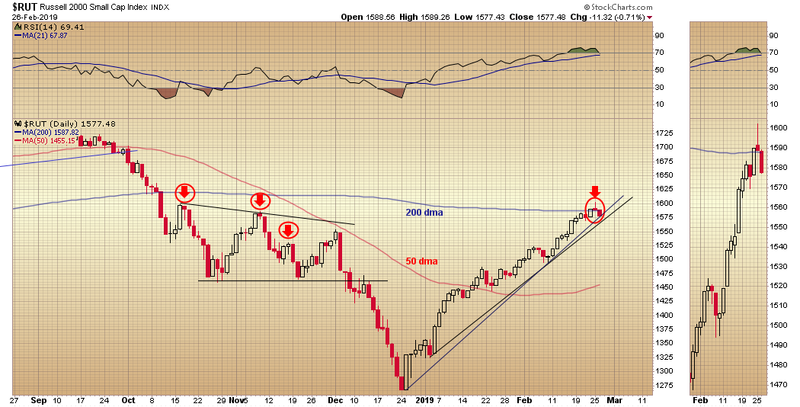 It has been on a rounded bottom-like trajectory, basically in bullish divergence to price over the last month. This is a sign of improving price momentum. On balance volume has been rising this year and suggests buying interest. One negative is the lack of volume. That has got to improve if Apple shares are going continue to move higher. 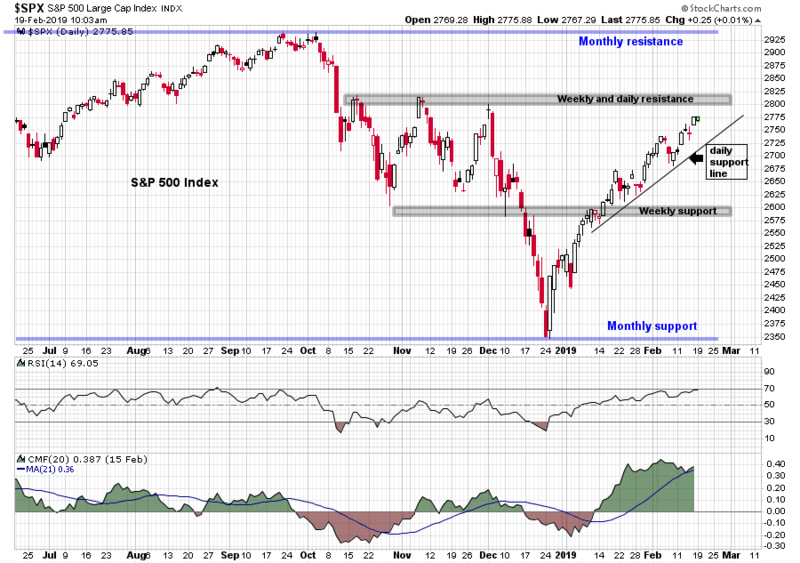 Interestingly, the weekly chart shows that the 38% resistance level of the October 2018 high and this year’s January low, is also the 38% retracement level of the 2016 low to the 2018 high. The Fibonacci lines do seen to have had some influence as support and resistance on the way up and on the way down, in 2016 and 2018. 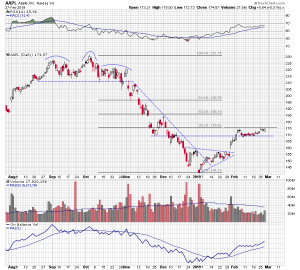 The added dimension of shared Fibonacci levels would reinforce resistance in the $175 area going forward. The action in Apple shares over the last month has been sedate. The market continues to struggle with exactly how to price its new hardware-turned-services profile. But a confirmed break above the $175 level might be a first sign that it is reaching some evaluation consensus, and a positive one at that. 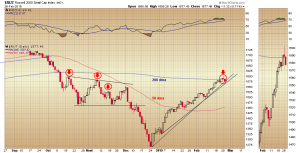 The Dow Jones Transportation Average has dropped back below its 200 day moving average and is testing an uptrend line that has been in place since the beginning of the year. The 200 day average thwarted the transportation average’s advance several times at the end of last year, and one such test directly preceded the December drop. Once again, the moving average is acting as resistance and the transportation average has pulled back and is retesting an uptrend line in place since the beginning of the year. One of the worst performing stocks in the transportation sector is Schneider National (SNDR), a close second in under-performance was J.B. Transport Services (JBHT). Check out the interactive chart which includes C.H. Robinson Worldwide (CHRW), Landstar System (LSTR), and the Dow Jones Transportation Average. It compares relative performance in the group over the last year. If the Dow Transports are rolling over it is likely that the worst performers will continue to lead their peers to the downside. 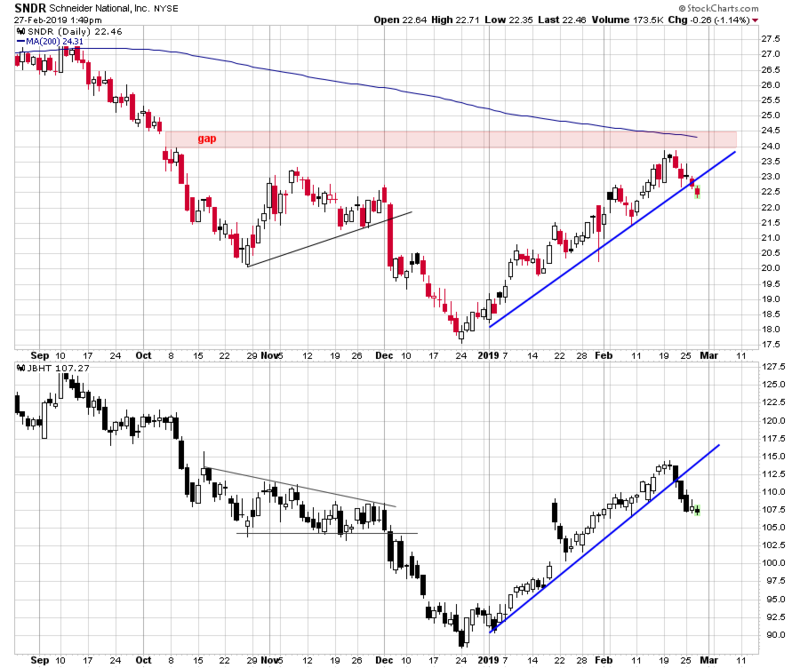 Both SNDR and JBHT are breaking below year-to-date uptrend lines on their daily charts. At this early stage in the potential decline they offer good risk/reward short-sale entry points. Remember that shorting a stock is risky and if the trade does not include a close disciplined buy-to-cover stop, it can be very costly. The small-cap stocks have historically led the broader markets. In the past, changes in the direction of the Russell 2000 Small-Cap Index have preceded changes in the direction of the market as a whole. Not always but it has often been the case. So, when a reliable reversal pattern forms on the Russell chart it deserves our attention. 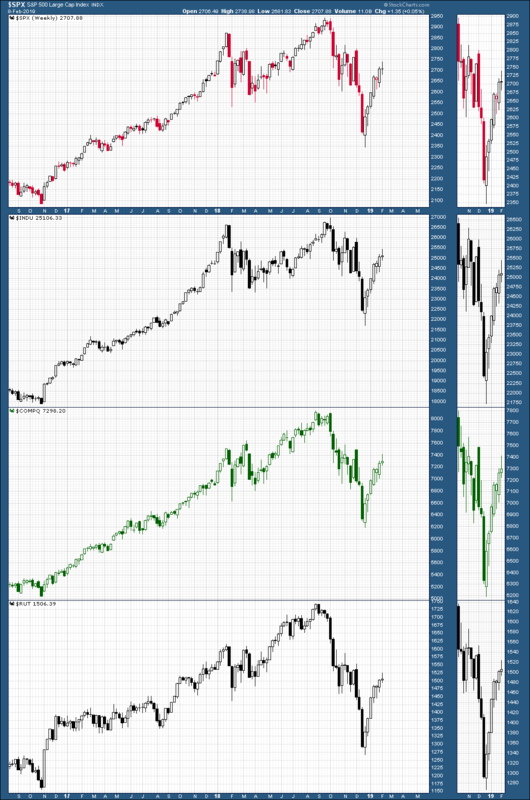 The eveningstar pattern is a three-period bearish reversal formation that consists of a white up-day candle, followed by a doji candle, one with a narrow opening and closing range, and completed by a red down-day candle. It represents a transition in investor sentiment from bullishness, to indecision, to bearishness. An eveningstar pattern has formed on the daily Russell chart. 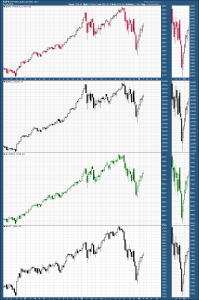 Similar patterns also formed in October last year and twice in November. They signaled tops. The current eveningstar includes a “gravestone” doji, which is a reversal candle on its own, with a narrow opening and closing range situated at the lower end of the overall range, and has a high wick. When a bearish reversal signal forms after a period of strength or at a well-defined level of resistance, it takes on particular significance. The current eveningstar has formed at the 1600 level which has previously acted as resistance, and directly below the 200 day moving average. In addition, the relative strength index is in an overbought condition. The Russell is not the only market index that has returned to an important area of resistance. In case you are not aware, the 2800 level on the S&P 500 index is, in fact, resistance. It has been widely reported on FinTwit and everywhere else. So, watch the Russell for a reversal because it is likely the rest of the market will quickly follow. 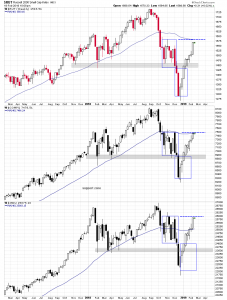 The major market indices are back to where they were before the alarming December decline and the euphoric December rally. It is important to understand what this means from a supply and demand perspective. Those traders who held long positions through this four month roller coaster ride may be very happy to have recovered their losses. Many will be anxious to sell their long positions after now being made whole. On the other hand, there are those that panicked and sold into the decline. These same traders likely missed the sharp bounce and have seen the market rally back up, past the levels where they sold on the way down. They want to make up those losses and don’t want to miss out on a potential second phase of the December rally. They are buyers into this test. 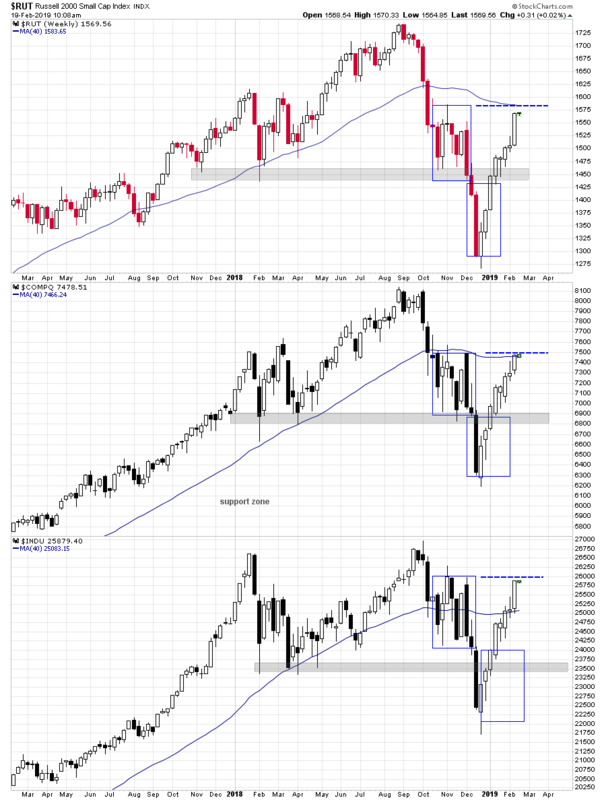 So as the give-and-take dynamic of the market takes place it is important to know the location of those key levels of support and resistance around which it will play out. 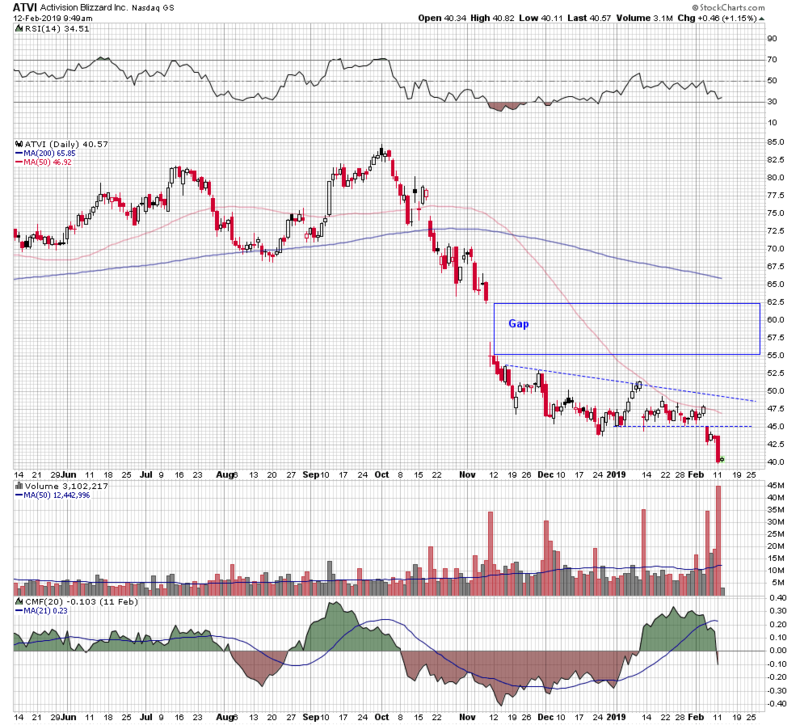 Activision Blizzard (ATVI) shares have collapsed since the October 2018 high. They retraced more than half of their incredible rally off the 2015 low. 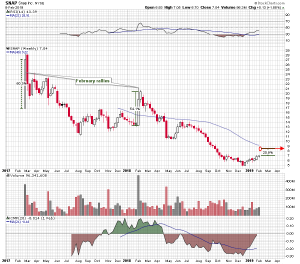 The weekly chart shows Activision’s heroic rise and its sudden reversal. The company is reporting earnings after the close today and may announce plans to layoff workers because of slowing sales. The good news is that the stock price has dropped to just above a wide zone of support situated between $39 and the $34.75 levels. The bad news is that even in the unlikely event that Activision rallies off the report, all the support levels broken on the way down become resistance on the way back up. Any recovery process will likely be long and arduous. 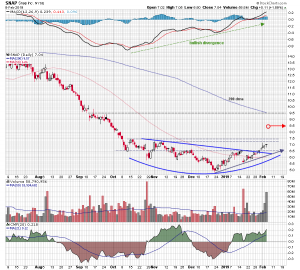 The daily chart shows several of the initial upside resistance levels. One positive takeaway from this chart is the very wide open November 2018 downside gap. Gaps are eventually filled is the old technical adage. 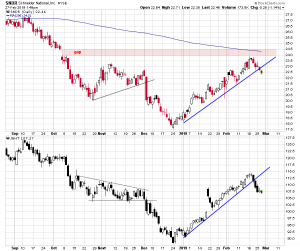 If there is some potentially good news out of the call today, shorts may begin to cover and that vacuum of price action between $62.50 and the $55 levels could be quickly filled. Quickly, in this case, being a relative term. The bottom line is that no one knows how Activision will trade after their earnings report today. The charts are a guideline and show levels of previous conflict between buyers and sellers. Those levels usually remain relevant when retested. Over the last 52 weeks McDonalds (MCD) shares outperformed the S&P 500 index by about 8%, but year-to-date they have underperformed by that same percentage. 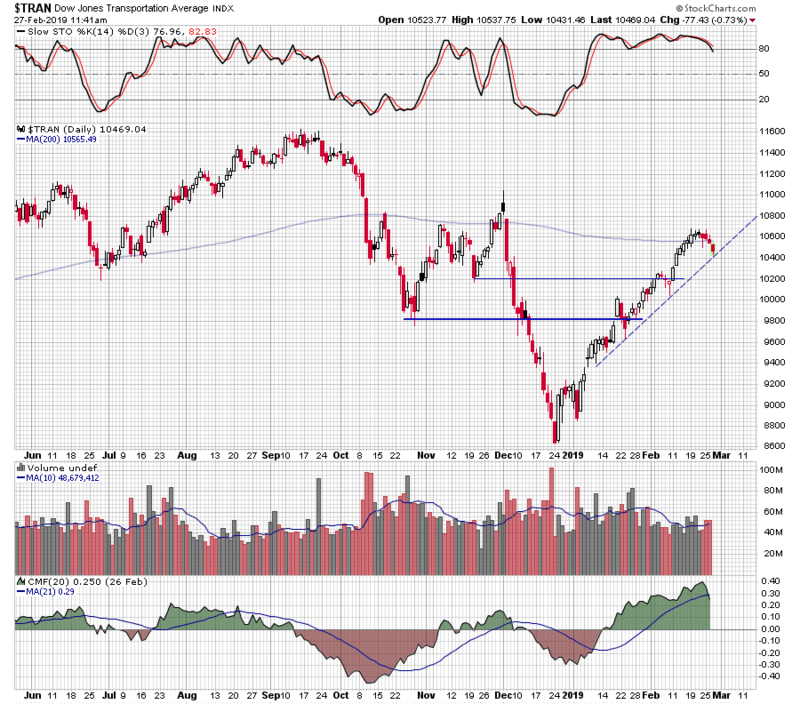 The stock is not participating in the current broader market rally and a double top may have formed on the daily chart. McDonalds high in November touched the $190 level but then the stock price quickly reversed direction, dropping $20 to the December low. Shares began to rally at this point along with the broader market, but about two weeks ago after returning to the $190 level, a large bearish engulfing candle formed. 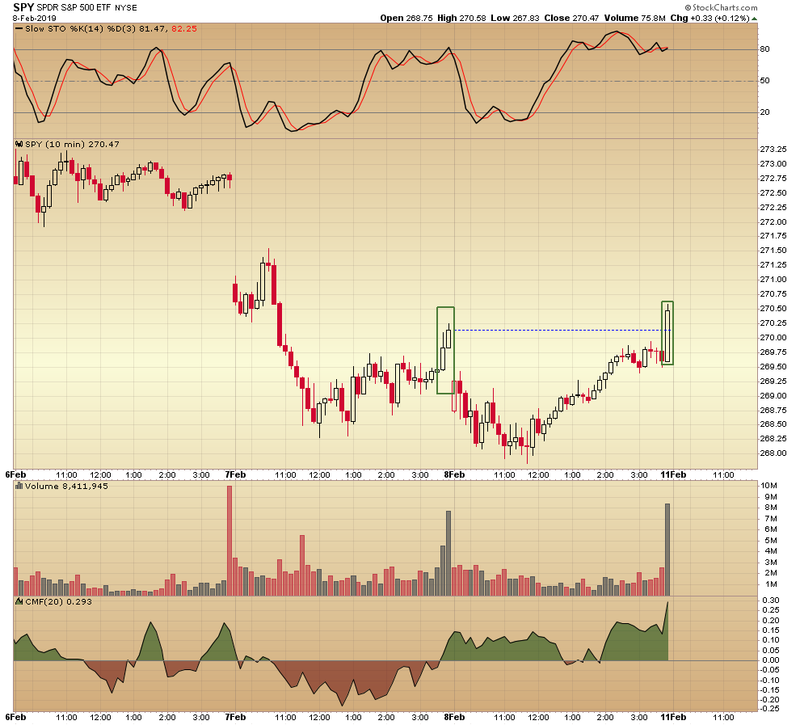 That signaled another top and and the stock price began to fade. 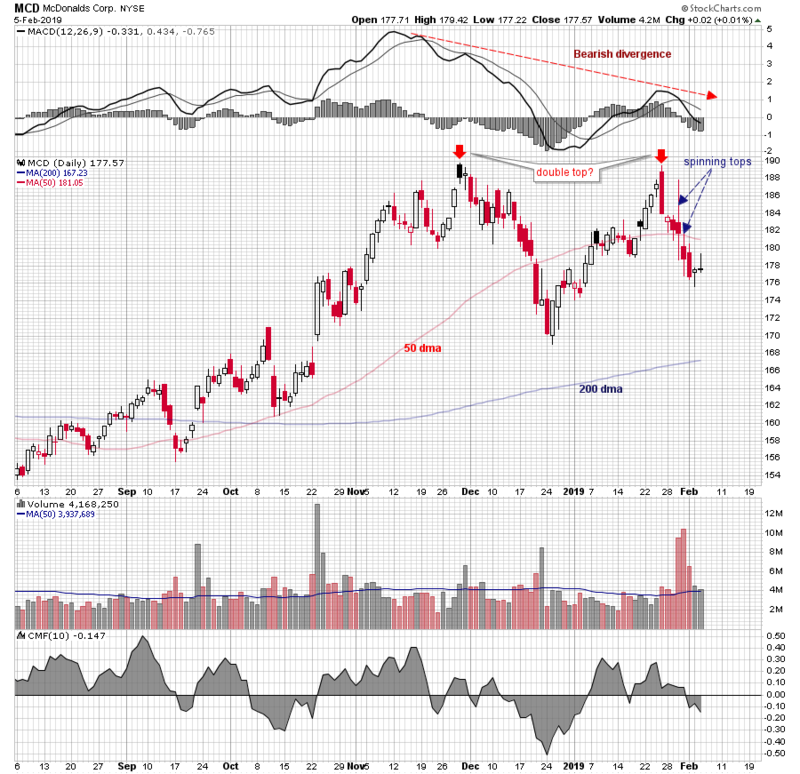 This reversal was presaged by the bearish divergence in the moving average convergence/divergence oscillator (MacD) which made a lower low as the stock was returning to the $190 level. 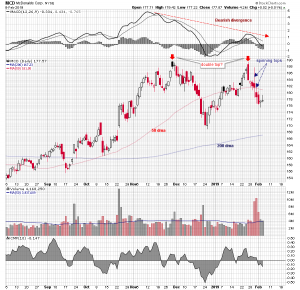 Since the engulfing candle formed and the stock price started to reverse to the downside, two high wick shooting star candles and a several red or dark body candles have formed on the daily chart. 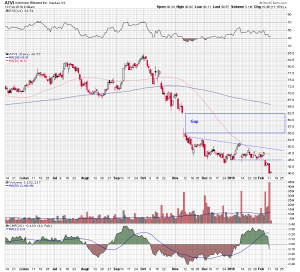 High wick candles after strong upside moves are a warning sign, as is a bearish large body candle. McDonalds shares are back below their 50 day moving average and Chaikin money flow has moved into negative territory. 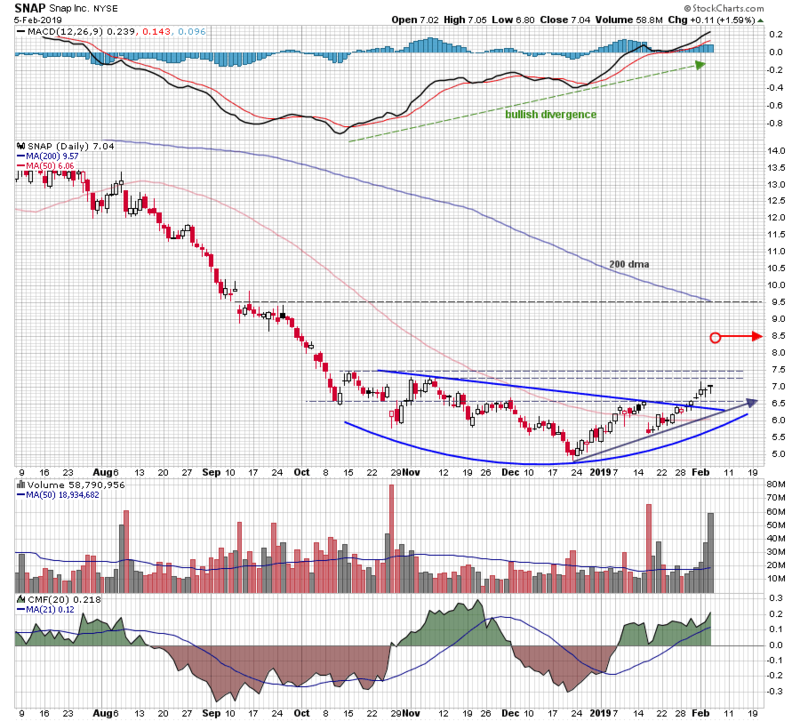 All this as the broader market continues to rally. Further downside that takes out last week’s $176 low, would likely be the catalyst for another test of the December low and the 200 day moving average.